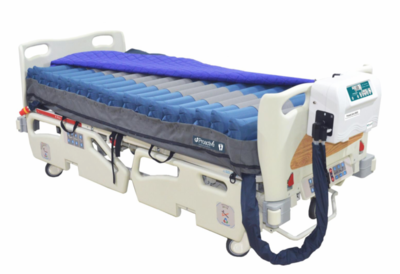 The 42" true low air loss 99MAX, This True Low air loss mattress system is commonly used in many hospitals for healing and preventing all stages of bedsores. It offers an extraordinary therapeutic benefit that is used for a wide variety of patients for optimal comfort, pressure relief, and healing of up to stage 4 bedsores. This bariatric low air mattress is ideal for pain management using 3 distinct therapy modes for advanced healing and patient comfort. Alternating pressure therapy mode sets the new standard in the prevention and treatment of pressure ulcers. The caretaker can easily change the alternating cycles from 5-15 minute cycle to promote consistent blood flow or an extended cycle of 20-30 minute to increase blood flow over an extended period of time.